livin vintage: Mad Men Week: Joan Harris Giveaway! What better way to begin the week, than with a giveaway? This season, Mad Men fashion designer, Janie Bryant, had Joan Harris wearing a lot of scarves. On her neck, in her hair, on her purse -- you name it! 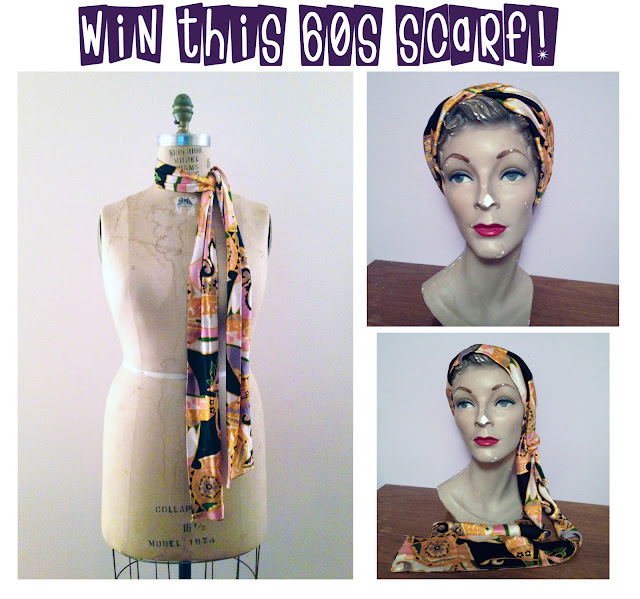 In honor of that and of Mad Men week, I am giving away this groovy 60s silky polyester scarf. There's a multitude of ways to wear it, although I think my favorite might be the turban style. 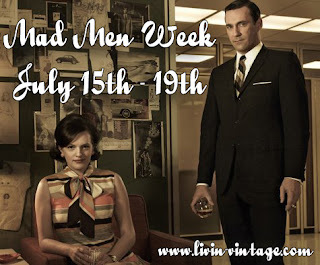 -share the Mad Men week button via your blog, facebook, instagram, pinterest, twitter, etc and leave a separate comment. Giveaway closes Thursday July 18th at 11:59 pm EST. Winner will be announced Friday July 19th. Gosh Girlfriend will love this! haha I think my favorite Season is season 2. It was still set in the early 60's, i loved the formality about it and the picturesque, yet filthy picture of American Life that AMC wove for the season. Being in Australia I haven't seen season 6 yet. Hope its ok to comment on earlier seasons. I love the scene where betty comes in to SCDP in season 4 and for the first and only time you have Betty, Peggy, Joan and Megan all in the same room! I loved betty's floral sheath dress, and megan's mod yellow frock. For all time fave frock, I'd pick Joan's red bow christmas party dress. So smokin awesome. Cool! I follow you on Pinterest. I adore Joan Harris, and basically love all of her looks. I so wish I had her closet! I think my favorite outfit was her beach outfit. And I liked her print dress from episode 10 I think. Betty had some great dresses this season, too.